Runyon Industries offers a fleet of private rail tank cars for shipments throughout the United States, Canada, and Mexico. Runyon Industries is centrally located within the United States just minutes from I-40/I-55, adjacent to the Mississippi River, and north of downtown Memphis, Tennessee. Runyon Industries is served by the CN Railroad, allowing access to all major US railroads. Runyon Industries can offer its’ own fleet of private rail tank cars for shipments throughout the United States, Canada, and Mexico. 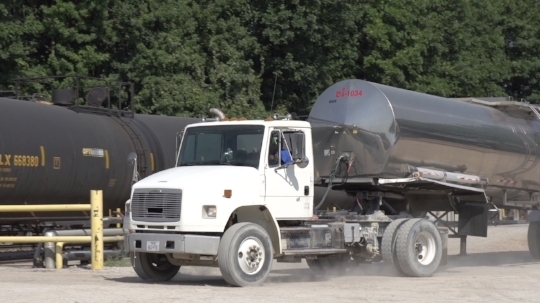 For regional shipments, Runyon Industries provides a delivery service through the use of its’ own tank trailers for reliable and safe delivery of product. Runyon Industries utilizes ISO Tanks, Flexi Tanks, Totes, and Bulk Vessels for international shipments. Runyon Industries is equipped to trans-load to or from Rail Tank Cars, Tanker Trucks, and Barges. Trust Runyon Industries’ experienced and knowledgeable professionals to take special care when shipping and expediting your local, regional, and global shipments. In addition to our current processing tank farm, Runyon Industries recently installed four, 500,000-gallon storage tanks to provide additional storage to our customers and is prepared to build more storage tanks as needed. Runyon Industries monitors inventory levels daily and schedules JIT transportation.